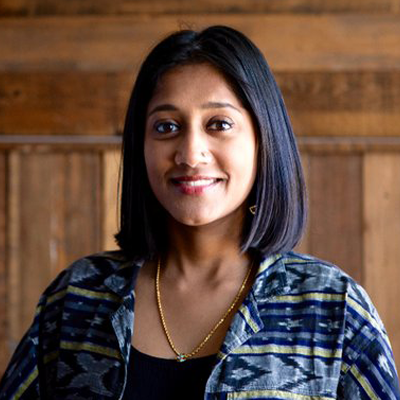 Abi Ramanan is co-founder and CEO of food-technology company ImpactVision, which interprets hyperspectral images (a combination of spectroscopy and digital imaging) to give food producers and retailers information in a non-invasive manner, facilitating superior decision-making, optimising food chain processes and preventing food waste across the globe while also maximising yield and quality of products delivered to consumers. After several years of developing campaigns and communications for a range of NGOs including Oxfam GB, the Fairtrade Foundation, and Sustain: the alliance for better food and farming, Abi turned her attention to social business and founded two food social enterprises in London, Papi’s Pickles and DayOld, tackling a range of issues from migrant employment to food waste and child hunger. In 2015, Abi won a scholarship to Singularity University’s Global Solutions Programme, where she co founded ImpactVision. Abi is also one of Nesta’s 50 ‘New Radicals’ 2016, a Unilever Young Entrepreneur Award Winner 2018, an MIT Innovators Under 35 Awardee 2018 and a World Economic Forum Global Shaper.